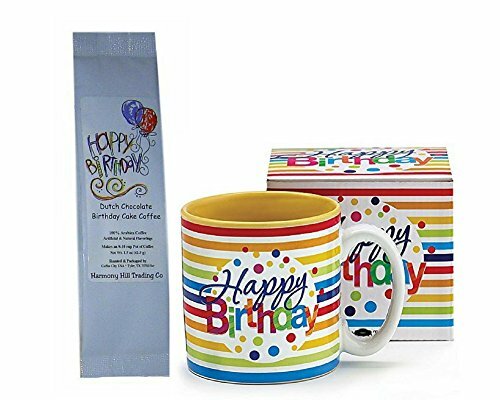 Happy Birthday Stripes and Dots Coffee Mug Cup with Dutch Chocolate Birthday Cake Coffee Gift Set 2 Item Bundle by Mixed at 365 Days Of Kindness. Hurry! Limited time offer. Offer valid only while supplies last. Make their special day even more special with this thoughtful gift set! A nice surprise for friends, family, and coworkers. Starbucks Travel Coffee Reusable Recyclable Cups With Lids, Sleeves, Via Instant Coffee Sampler Gift Set Bundle With Burlap Bag, Rustic Gifts For Mom, Coffee Lovers, Birthdays, Anniversaries.